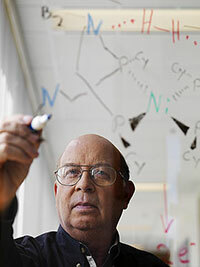 Dan DuBois will be honored at a 1.5-day symposium at the upcoming American Chemical Society meeting. Given his scientific successes and personable nature, it is no surprise that the slots filled quickly to speak at the 1.5-day symposium honoring Dan DuBois at Pacific Northwest National Laboratory. The symposium honors DuBois' contributions, including his inorganic chemistry work and his latest award, the American Chemical Society's Award in Inorganic Chemistry. DuBois is known for his unique approach to designing catalysts, inorganic molecular complexes that speed reactions. He answered fundamental questions and used that knowledge to rationally design better catalysts; his scientific and review articles are frequently cited. He also takes the time to inspire others and mentor future scientists. Aaron Appel and Monte Helm at PNNL, and Jenny Yang at Joint Center for Artificial Photosynthesis, are organizing the symposium. All three relocated to work with DuBois during their careers. "When you meet an outstanding chemist who is also so caring and personable, you don't pass up that opportunity to work together," said Helm, who is now the Deputy Director of the Center for Molecular Electrocatalysis, a DOE Energy Frontier Research Center at PNNL. The symposium features speakers who have either worked with DuBois or are in related catalysis fields. Together, the talks will provide a top-notch overview of energy-focused inorganic chemistry research. The speakers include Morris Bullock and Michel Dupuis from PNNL, Jim Mayer from the University of Washington, Nate Lewis at JCAP and Daniel Nocera at Harvard University. "The hardest part of doing this was getting it down to 21 people," said Appel, who worked with DuBois while completing his doctoral degree at the University of Colorado. "There were a lot of people who wanted to present." In addition to attending the symposium, DuBois will be giving a 35-minute award keynote address. His talk promises to be a seminal overview of his career.